Volercars brings to you an exciting way to earn free VMiles (cash back points). 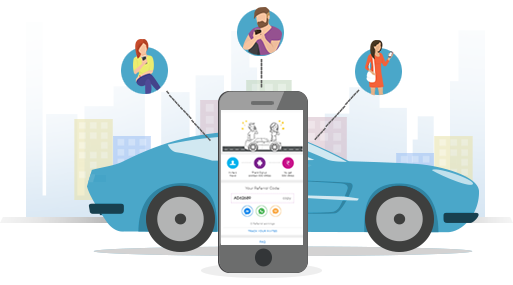 Just invite your friends, family and colleague with your referral code and when the referred person signs up through Volercars app only, they earn 500 VMiles, and you earn 500 VMiles. Redeem the Vmiles on your next booking with us. Invite friend, family or colleague with your Referral code. When the referred person signs up through our app , they earn 500 VMiles, and referrer earns 500 VMiles. Redeem Vmiles on your next booking with us. Use VMiles to get attractive discounts on your next booking with us.